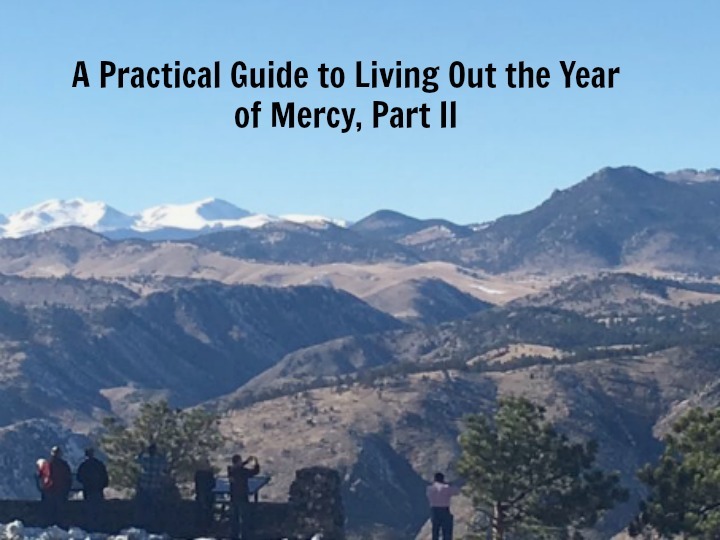 Last month I shared with you seven practical ways you can live out the Year of Mercy. Today I am sharing 10 more family friendly year of mercy activities for moms. As a busy Catholic Mom, it is important to set realistic goals for what we are attempting to do, “Be Merciful in the Year of Mercy.” Here are some hands-on, practical ways you can make a real difference in other people’s lives based on the Papal Bull “Faces of Mercy,” also known as Misericordiae Vultus. The Holy Father has challenged us during this year of Mercy to think of those outside of our daily walk of life. He challenges us to find friendship in people that are “different” than us and encourages us to reach out to those who are lonely. As moms, what could be better then having your children’s classmates over that rarely gets an invite, or reaching out to a new family in the parish or school or just seeking out those who need a good friend. When we seek to befriend others we are acting like Jesus Christ. 2. Smile, Mom, and Be Cheerful! It is easy to pick up the laundry, drive the carpools and serve your family with a frown on your face. There are days when I don’t want to do another thing for someone else, but the reality is we need to find joy in our service and understand the real gift is that by serving we are more like Christ! Our attitude is what separates us from doing just duties or work. Our cheerful attitude can penetrate the hearts of other or be a witness to our Catholic Faith. 3. Don’t Miss Out on a Universal Event- Mark Your Calendar! One of the greatest blessings about being Catholic is the universality of our Church. We do not only celebrate the same sacraments but we can celebrate and participate in extraordinary events like the “24 Hours of the Lord.” This amazing event will take place the Friday and Saturday preceding the Fourth Week of Lent. The theme of this great event will be “God Is Rich in Mercy” (Ephesians 2:4). This is an event that should not go unnoticed or forgotten! We are going to be given an unbelievable opportunity to experience God’s mercy and to help our family and friends come closer to Christ. Just think, the Holy Father is asking us to celebrate God’s rich mercy together on the same day! So moms, if we can remember to get our children to soccer tournaments, birthday parties and important academic and club meetings, let us not forget to join in the Church and celebrate this amazing event! 4. Confession, Anyone? Take Time Out to Go! I have found that when life gets difficult for me, going to Confession can be a huge help. Confession is like taking a nice hot shower for the soul. It is an opportunity to reset your “life button” reflect on what needs to change and for what you need to seek out forgiveness and receive the graces you need to live out your vocation of being a wife and mom! Confession and mercy go hand-in-hand. When we turn to God the Father and ask for forgiveness, we receive the graces we need, are better able to serve others and improve our earthly relationships. 5. Know Anyone Suffering from Abortion? One of the hardest subjects to discuss with others is abortion. For many people it sparks debates and anger, but the fact is no matter what a person’s feelings are on the issue, this subject is about death, pain and suffering for a child and his or her parents. Pope Francis wants to take that pain away and is offering these men and women an amazing gift- God’s mercy. 6. Missionaries of Mercy: From Rome to You! In a world of materialism, it is important to realize that corruption is a temptation for all walks of life. It is easy to “scrape off the top,” but during this Year of Mercy we are called to turn away from all forms of corruption. As mothers we need to help our children understand that our moral choices matter and that we must choose to turn away from sin. During the Year of Mercy, we must not only perform Merciful Deeds, work on developing a merciful heart, develop a deeper prayer life and appreciate God’s Mercy but also seek to better understand the role of justice and mercy. As mothers, we serve an important role of being our children’s advocate. By seeking justice for our family and those who cannot seek it on their own, we can teach our children to do the same for others. When we seek to bring about justice combined with mercy, we are better able to live out our Catholic Faith. Justice and Mercy are not opposites, but rather complements! One of the most misunderstood concepts within the Catholic Faith is that of “Indulgences.” As Catholic mothers, we need to understand that the Church is offering us a tremendous gift for our soul and the souls of our family members! We can sometimes forget that we are called to evangelize and share the Gospel with others. Pope Francis challenges us mothers by reminding us that the message of mercy is not just for Catholics. We are called to “eliminate closed mindless and disrespect” that never has a place in important dialogs. This Year of Mercy is an opportunity for the world to learn what it means to show mercy to others. If we are willing to be merciful, we will inspire others to do the same. Photos copyright 2015 Emily Jaminet. All rights reserved.